Ha ha ha! Ha ha ha! Ha… *cough* So… remember on Monday how I promised the unveiling of my new website on Wednesday of this week or at the very latest, Thursday? Well there’s a funny story that goes along with that. That may have been a phenomenon we call Premature Excitement (or PE for short) and let me tell you, it’s just as embarrassing as the other type of PE (I would assume; since I’m a girl, I guess I don’t really know). My website team has informed me that there’s been a setback with the importing of the HTML code as related to the radius of the internet multiplied by π. And something about the space-time continuum. It’s also possible sine and cosine were involved; I stopped listening after awhile. That's an entire brand new container of liquid laundry detergent. 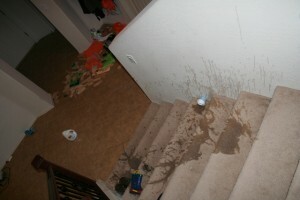 Thrown over the railing upstairs by our youngest, soon-to-be-felon. And he would have had lots more time to work on the website problem. Beggars of awesome (and free) websites apparently cannot be choosers of the time-frame in which said websites are produced; is the lesson we have learned today. Also, the cure for PE is to keep your trap shut until the website is actually done. I do, however, have a recipe for you as a peace offering. I made a new dinner last night that turned out really well and was healthy and easy. So… there’s that. Combine first seven ingredients (white parts of green onions only). Add a little Tabasco sauce if you don’t like spice or a lot if you do. Form mixture into smallish meatballs. Heat veg oil in a NONSTICK pan (I screamed that because I tried it first with a regular pan and it was a totally failure of sticky, crumbly proportions). 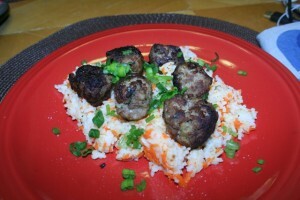 Fry meatballs in batches until all sides are brown. When meatballs are fried, put them in the oven on a cookie sheet at 450 for 10 minutes to make sure they’re cooked through. Make white rice according to directions. When it’s done, toss the shredded carrot on top and put the top back on (it’s removed from heat now, but there’s still enough steam to lightly cook the carrot). 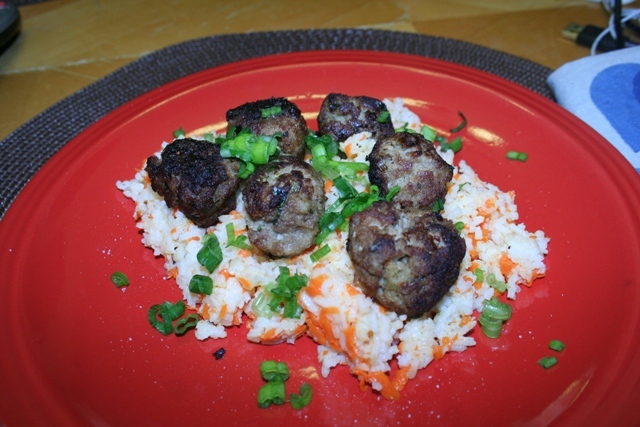 Serve meatballs on the rice, topped with the green parts of the sliced green onions and lime juice. I’m glad the meatballs turned out-even after learning the hard way…(I’ve done that plenty of times). 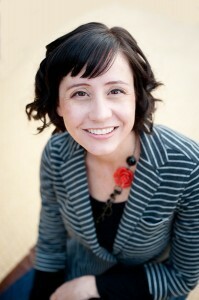 Boo about the laundry detergent :/ I have found myself enjoying reading people’s blogs…I like how you post recipes. I think I will try this one. 🙂 Thanks for sharing. Oh, Jonas in stripes. I remember we had this conversation about Gray and toilets a few years ago. You are a hero in many ways! The website will come. You can’t rush perfection.